LG is the first company after HTC to follow the path laid out by Valve for headset makers to bring their wares to SteamVR. That path involves using SteamVR Tracking technology and OpenVR API to create a headset which can tap into the same Steam-powered content ecosystem as the Vive. LG’s step into VR represents more than just a new headset though, it represents new choices for consumers and new competition for HTC. When Valve set out to create their VR ecosystem, they wanted to create a foundation that would let VR headset makers of any stripe deploy to that ecosystem. 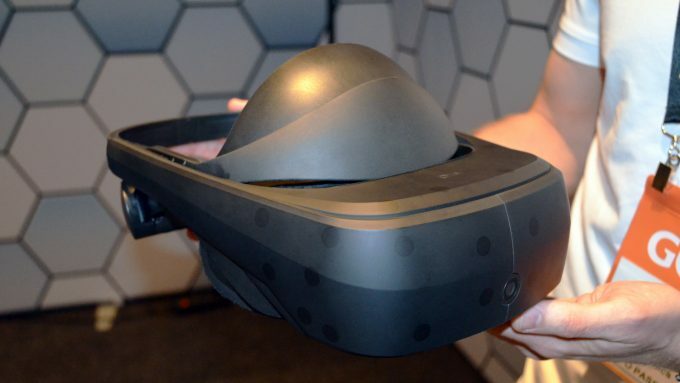 While Valve early on worked closely with HTC to manufacture the Vive headset under the HTC brand, it seems like Valve is increasingly ready to begin stepping back from such direct involvement in the Vive, and begin to let it exist as one SteamVR headset among several; a move that will see the headset makers compete among themselves to make the best headset that fits consumes’ wants and needs. Since the launch of the Vive, LG is the first company to follow the blueprints Valve laid out for any company to create a SteamVR compatible headset. The LG VR headset uses the Valve-invented SteamVR Tracking, and also uses the OpenVR API to make itself compatible with any content that’s been created for SteamVR. From an external standpoint, the LG VR headset is something like a Vive mixed with PlayStation VR style ‘halo’ head-mount (which rests comfortably on your forehead), which also includes a very handy ‘flip-up’ functionality which we’d love to one day see on all VR headsets. When the visor is flipped down it can be slid into place closer to the eyes, allowing for a widely adjustable eye-relief. The display enclosure is perhaps a bit less tall than the Vive’s, but seems a little longer as a result. 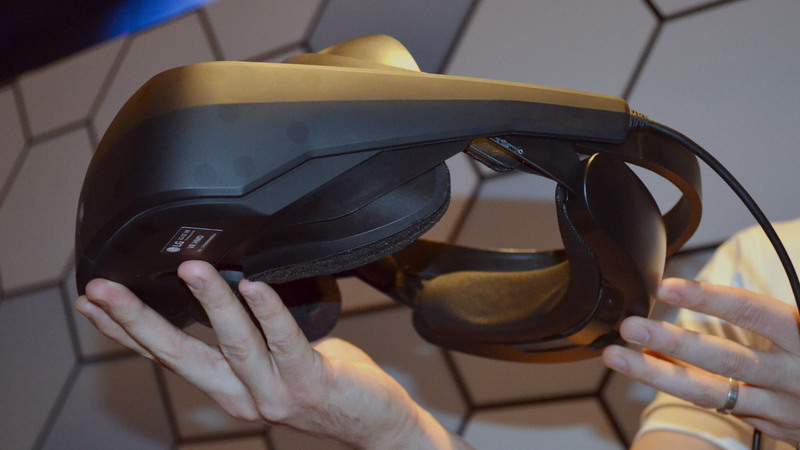 At present prototype is not so much a step forward for VR ergonomics as much as it is a different (and arguably more comfortable) mounting option; weight and size wise, it’s doesn’t feel substantially different from the Vive. 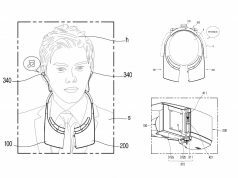 The LG VR headset prototype is for now relying on a separate pair of headphones, something we hope to see integrated by the time the consumer version rolls out. While the Vive is covered in little craters—at the base of which lay the SteamVR Tracking sensors—the LG VR headset’s sensors are flush to the rest of the external casing. This makes the product feel a touch more refined, though the sensor lenses still stand out as little shiny disks. On the front of the LG VR headset is a front-facing camera, though it is non-functional on the current prototypes. A single cable extends from the LG VR headset which I was told was an HDMI connector, but a nearby headset under glass had a connection that looked an awful lot like USB-C, which would make more sense because HDMI alone can’t supply nearly the power necessary for a VR headset. This is actually an incredibly smart design. If the price is comparable to vive, besides comfort, I’m hoping for some other neat or better features. However, the comfort is a major plus. When I decide to get a 3rd HMD, I’ll be looking for comfort. Right now I can barely use the vive while wearing glasses. Ouch. Rift is a lot more comfortable, however, tracking is a problem. Can’t wait to see other headsets that use steamVR. 17% better resolution over rift and vive. Oculus cut price to reduce inventory. A court ordered injunction is on its way. So I guess LG and Vive are the new big 2.
that injunction will not see the light of day. It’s a bit premature to say that I think. This dev unit has the same resolution as Gear VR and as someone with both I can tell you there’s barely any perceptible difference in clarity. That’s because the Gear VR (and the LG prototype) do not use custom VR screens. They use screens designed for smartphones. You’re comparing a 1200p made-for-VR screen to a 1440p made-for-phones screen. The final version of the LG HMD will surely have improved pixel spacing, and likely will be non-pentile. I’m just talking resolution. A sufficiently higher res display should be sharper whether it’s “made for VR” or not. Neither screen is 1200p. The 1280 dimension mentioned is half of 2560 – it’s the horizontal dimension as seen by the wearer. 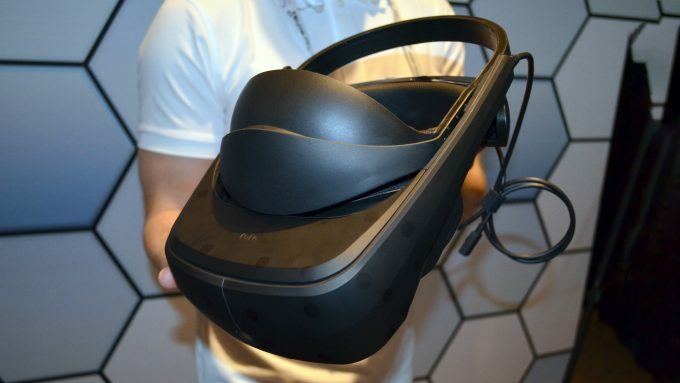 Both this device and the usual Gear VR devices are 2560×1440. There are no OLED screens (for VR or otherwise) that are not pentile and there is a reason for that. It’s possible that LG will find another arrangement that works but I consider it unlikely. Why would HTC, Oculus and indeed LG not have done it by now if it was beneficial? The only major VR headset that is not pentile is PSVR and that’s because they use an LCD display. If they did try a different subpixel arrangement it could allow for higher pixel density but again that is premature to assume given we have not seen such a display. Wait, when you said “someone with both”, you meant you have the LG prototype that was shown off at CES? I didn’t realize they were giving them out yet. I thought you were comparing Gear VR to the Vive and Rift, which are 1200p. Do you know of any particular reason why OLED screens can’t do RGB rather than Pentile? I figured the reason the Vive and Rift are Pentile is because it’s cheaper. But technology gets cheaper with time, and actually it’s been confirmed that the new Galaxy S8 will use a full RGB OLED 1440p display. And since the people at LG are experts on display technology, I think they of all people can pull off a reasonably-priced RGB OLED 1440p display. Which will already be common (in the S8) by the time this HMD is released. Subpixel density is a separate issue from Pentile. The Vive and Rift CV1 are Pentile 1200p, but they have about the same SDE as the Pentile 1440p Gear VR, because of reduced pixel spacing. Using pentile is not about cost, but subpixel efficiency. There is a technological limit of how many dots can be put on the screen. With R-G-B you need 3 dots to make a single pixel. With Pentile (RG-BG) you need only 2 dots to make a single pixel, so thanks to pentile higher resolution can be achieved with the today’s tech. It also exploits eye’s better sensitivity to green color, just like TV did for many decades and compression still does in mpeg, jpeg, bluray, youtube etc. Even HDMI 2.0 4k60 fps does this (chroma subsampling) because of limited bandwidth. Of course, when you invest billions in R&D and fabs you can push these limits further and make ever more dots, but Pentile will ALWAYS give you better effective resolution (that 2 to 3 ratio doesn’t change and will be true forever). So why did Samsung decide to go with RGB for the Galaxy S8? Could it be because they wanted it to have better VR quality but without having to process more pixel data? If so, might LG use RGB for the same reason? So the VR image quality can be better, but without the user’s GPU having to process more pixel data? I figured out recently that an RGB screen in VR is roughly equivalent to a Pentile screen with 15% more vertical resolution. I based this on the fact that everyone says the SDE is about the same between the PSVR and the Vive / Rift. My guess would be that the tradeoffs that led to the use of the pentile arrangement in the first place are no longer valid. When OLEDs were introduced they had to compete with mature LCD tech on power consumption and pixel density. Early pentile addressed both but many people didn’t like them, finding text harder to read. Later arrangements such as Sammy’s diamond pattern combined with higher densities and and efficiency have largely addressed those issues and would likely have remained as-is except for the new issue of SDE. When the display is inches from your face that matters more and with density and power consumption in line I guess they figured it was time to go full circle. From what I’ve read, Pentile looks almost the same as non-pentile from a standard viewing distance, but when viewed up close, it looks worse. Pentile uses some kind of algorithm to convert the image from the full resolution into the Pentile dot pattern. And it looks worse close-up. Ya it’s something of a philosophical issue. They’re optimizing based on the workings of the eye but the fact is you don’t get something for nothing. There is less information in the display and attempts to make up for that are inherently lossy. Whether true or not, SDE is a real issue and I believe converging on RGB solves both issues. Chroma subsampling has nothing to do with “eye’s better sensitivity to green color” and PenTile. The eye’s higher sensitivity to brightness than to color (due to the rod cells / cone cells ratio, which is around 20) is why chroma subsampling was selected as viable video/image bandwidth reduction technique. Color TVs has always had (at least) 3 sub-pixels per pixel with the exception of some budget plasma/lcd TVs in the recent past (they used some form of PenTile structure). Some SHARP panels actually had 4 sub pixels (adding a yellow one) and LG OLED TVs have RGBW structure, white sub-pixel being the forth in order to boost overall brightness (actually all four are white, but the other three have color filters on top of them; this is done to equalize the aging speed of the subpixels). You are mistaking display tech and video signal. HDMI 2.0 also has 4:4:4 4K60 modes (both YCbCr and RGB) at 8bpp, it’s up to the display manufacturers (and STB, BD Players, graphics cards, etc.) to support it. You are mistaking it with HDMI 1.4 which supports 4K60 only with 4:2:0 subsampling. But I agree that there are more green subpixles in a PenTile structure because of the “eye’s better sensitivity to green color”. Again, this has nothing to do with chroma subsampling in videos/images. The problem with pentile is those 2 subpixels do not make a full pixel. You need R, G and B to make a single multicolour dot and pentile shares subpixels so they are not truly independent. We can debate whether that’s an economic or efficiently issue but the fact remains that you have less independent addressable pixels for a given subpixel density than with RGB. hehe I wish… I misunderstood what you meant about 1200p; easier to talk in terms of dimensions IMO. Anyway I meant I have a Vive and Gear VR and the apparent resolution difference is negligible. As for pentile, as someone pointed out I was mistaken about there being no RGB OLEDs as PSVR’s display is indeed such a beast. Perhaps LG will go this route as well. If so it’s possible their headset will have less SDE than the Vive or Rift, in line with PSVR’s which is generally considered the best in that respect. Subpixel arrangement doesn’t get around subpixel size limits though. Pentile has 2 subpixels per pixel whereas RGB has three. For a given subpixel size that means lower resolution for an RGB arrangement. In other words an LG RGB OLED may not actually be 1440p as their dev unit is. PSVR is only 1080p. Even if it is we’ll need a significantly bigger jump to really see a difference in sharpness which is what current headsets lack. Retina-level resolution for VR is about 8k per eye; that’s the holy grail. It would be in-line with it if it were 1200p. Since it’ll be 1440p, it will be better. I highly doubt they’ll go to a lower resolution after showing off a higher resolution. That would be terrible marketing. It seems to me that at the current low resolutions, a small jump is definitely noticeable. It’s like the opposite of “diminishing returns”. I definitely noticed a big improvement in SDE between the Oculus DK2 (1080p) and the Gear VR (1400p). A good rule-of-thumb for the current FOV that I’ve figured out is to divide the vertical resolution by 4 to determine what resolution it appears as compared to watching a TV from the recommended viewing distance. In order to reach 4K TV levels, we’ll need 32K (divided into 2 screens). I might be off on that 8k number hehe… I remember reading some calculations of that in the past that I thought worked out to 8k but considering I could easily fit 3 4k monitors in the Vive’s FOV that clearly won’t be enough for full retina. Cheers, off to do some 1200p Project Cars VR racing! PSVR uses RGB (AM)OLED screen. It has the least visible SDE (or so I’ve heard, never tried it myself), but this is also thanks to the diffusion filter they’ve put over the panel to mask the subpixel structure. hmm right you are; it seems my information is out of date. I guess Sony has figured out a way to get around the usual reasons for pentile. Yes, one can only hope that the rest will follow by also using special made-for-VR screens in the next iteration of HMDs. Yep. Also, the Samsung Galaxy Tab S2 (and newer Tab S3 now) have 2048×1536 Full RGB-Stripe S-AMOLED Displays. So we do have Non-Pentile OLED for mobile just not for smartphones. It’s conceivable we’ll see more Full RGB in the future though I have my doubts. Also if we’re talking about OLED in general, LG’s 4K OLED TV’s are Non-Pentile. They are full RGBW. If mobile is anything to judge by that injuction will either be short lived as an appeal will delay it or it wont happen at all. Do you still have tracking issues with the rift after the 1.2 update? The rate at which VR hardware and software are advancing is actually kind of scary. First-gen headsets haven’t even been out a year and eye tracking, foveated rendering and wireless are all but confirmed for second-gen. Prices are dropping left and right and we’re seeing payment plans making even high-end VR affordable. We’re also now seeing legitimate competition in the PC-based VR hardware space, which is only going to accelerate progress and reduce costs. Also, a large contingent of the content coming out looks surprisingly polished and impressive when just a year ago, the vast majority of stuff was made by 1-2 devs in their spare time and with no resources. Times are changing and it’s all very exciting. It’s such a pity that it turned out that the pure black of OLED displays can’t be used when the display is used in a VR headset. I completely agree. When I first heard about OLEDs being used in VR HMDs I had this image in my mind of playing Thief with pure blacks. The Vive is better than others in this respect but it’s still quite noticeable. I haven’t been following this and indeed I wondered since last year: how come they do not use pure black? What is the tech issue? The main reason OLED is used in VR is pixel response time, however the caveat is that it takes much longer for a pixel to switch into or out of the fully off state. This leads to “black smear”. Picture a brighter scene with a black area in the middle. As you move your head around the black appears to smear out from the edges of the black area due to the brighter pixels not being able to shut off quickly enough. It’s quite distracting. As a result most VR systems keep the pixels at their lowest level without being fully off, leading to a reduction in contrast. Was initially excited to hear about the lenses and higher resolution, but the blur and the pentile OLED is a bit of a let down. It’s comparable or slightly better than the Vive in several ways but definitely not “next generation”. Honestly I feel the best effect of this will be to create more competition and drive down prices. If HTC really is stubborn enough to hold their price where it is now, maybe a lighthouse competitor will knock some sense into them. It’s just a prototype. I’d bet money the final version will have improved pixel spacing and will not be pentile. How much money are you willing to bet? Because OLED will always be pentile. It’s OLED. Unless they switch it to a LCD IPS display, it will be pentile. The Playstation VR uses an OLED non-pentile display. The Samsung Galaxy S8 will too. The rep must have been confused. LG confirmed it was USB-C in their UploadVR interview. Got it, thanks for the confirmation. Sony just released a phone with a 4k HDR display. I hope someone is looking into getting one of those into a PC headset. Pretty sure both major players stated they’re working on custom screens; the days of scavenging phone parts are over. By major players you mean HTC and Oculus? Neither are display manufacturers. Both partner with display manufacturers and may be customizing existing designs, true, but that doesn’t rule out working with Sony. I’m not suggesting they will though, I’m just more generally saying we need 4k VR please! Sony can’t be the only one with a 4k phone-sized screen, I think they’re just the only ones nuts enough to release a phone that uses one. LCD. Irrelevant and manufacturing is also different. What’s in this LG headset is currently the highest resolution OLED ever shown in the world in this size. Not true RE this HMD’s resolution. It has the same resolution as many phones – 2560×1440. A great news for SteamVR ecosystem: another big vendor is making a good headset for it. So it’s a 3K Vive knock-off with a confortable design (obviously)…price is the interesting information I hope LG will communicate soon. We’re being duped with all these VR headsets, they can do better but it’s a giant, long winded marketing strategy and in 5 years they will give us what they are capable of giving us now. Yes it is all a conspiracy. Those Lizard people have full immsersive VR already and are holding it back from us!